3 x 1.5 oz spice bottles. The hottest chili spice gift pack. Devil's Chili Powder- Pure ghost pepper chili powder. Extreme heat. Ghost peppers are over 1,000,000 Scoville Heat Units. 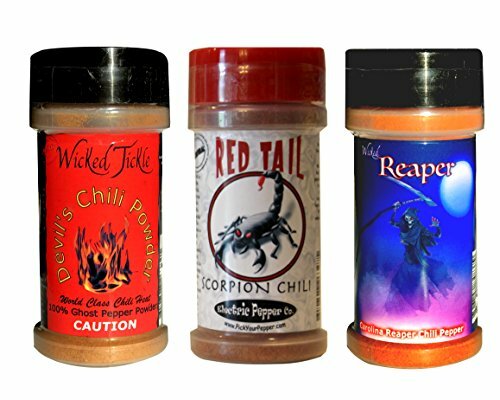 Red Tail- Scorpion chili pepper powder is extremely hot. Trinidad scorpion peppers are over 1,200,000 Scoville Heat Units and are the second hottest chili peppers in the world. The flavor of the scorpion chili is excellent. Wicked Reaper Carolina Reaper Chili Powder- Carolina reapers are the current world record holder at over 2.2 million Scoville Heat Units. Very intense and lasting heat. Warning: Do not use these products if you have a respiratory or heart condition. If you have any questions about this product by Wicked Reaper, contact us by completing and submitting the form below. If you are looking for a specif part number, please include it with your message. Spice Specialist's Dried Persian Limes/Limu Omani in a 1/4 lb plastic Bag (4 oz). Simple Girl Gourmet Spice Set With Southwest Seasoning - Sugar Free - Vegan and Diabetic Friendly - Carb Free - Gluten Free - MSG Free - Compatible With.